When I was in Hawaii, I did a “Discover Scuba” dive in which we made two short dives from a boat. Hawaii was a great place, obviously, for a first dive: the water was warm and clear, the fish were colorful, and we even got to see a flock of sea turtles swimming through the water. It was magical, serene, and unlike anything I’d ever done before. I vowed to myself that I would get my scuba certification so that I could dive again. 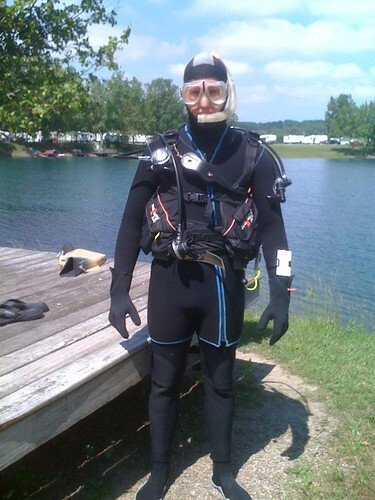 Last fall, I signed up for “Scuba I” through my employee benefit at OSU. It was a 10 week class split between classroom lecture on scuba principles, safety, and dive planning, and dives in the OSU pool to practice the skills we had learned. The instructor, Marty Bailey, was absolutely wonderful. He has a real passion for diving – he’s recorded over 3,000 dives! – and his enthusiasm comes through in his instruction. He’s got a real eye for detail, and helped ensure that his students were learning proper technique as required by the book, but also that we picked up a lot of practical experience along the way to better prepare us for real-world diving conditions. The class was fun, and at the end I was eager to do my four open water dives (as opposed to pool dives) that were required for the certification. Unfortunately, when I completed the class it was winter time, so I had to wait until spring for the weather – and the water – to warm up enough to do the dives. This weekend the weather was sufficiently warm that I was able to schedule my dives! I met Marty early on Saturday morning, and we drove to Circleville Twin Quarries. The south quarry was extremely busy, so we headed to the north quarry. It was considerably less busy, with only a single class getting in the water, and a few independent divers suiting up. Marty and I took our time unloading and preparing our equipment, allowing the other groups ample time to get into the water and on their dives before we entered. My first dive was 50-odd minutes long, in which I performed a number of underwater skills, like mask clear, weight belt removal and replacement, scuba tank removal and replacement, and air sharing. We took a leisurely tour of the north quarry, looking at a school bus, a boat, and a police car. On another boat rested a bowling ball, so we played catch with that for a while. We performed a few surface skills – cramp removal and tired diver tow – and then exited the water. The water was a little cooler than what I had been used to in the OSU pool, but overall the dive was very pleasant. I quite enjoyed how unafraid the fish were. For our second dive, we elected to move to the south quarry, which had pretty well cleared out by this time. The water was much murkier, because the earlier groups had stirred up so much of the silt on the bottom. I also forgot to spit into my facemask to prevent it from fogging up, so my overall visibility was extremely limited. I didn’t enjoy this dive quite as much. We stayed down for a full hour, and looked at an ambulance, an airplane, a bathtub, and a boat. I was leading the route on this dive, and ended up looping around twice to the same points. There were other objects in the water that I had wanted to see, but got myself slightly mixed up and never made it to them. Both dives were about 20’, which is about what I had in the OSU pool. 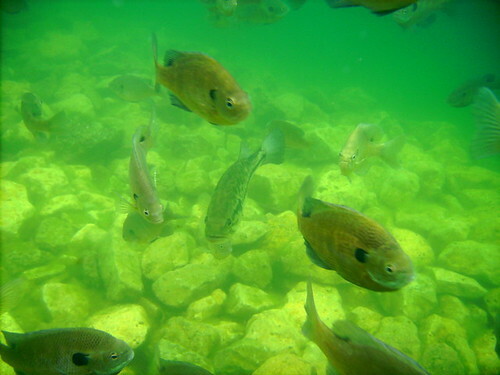 Aside from the fish, the grasses, and the submerged vehicles, both dives were very similar to my pool dive experiences. This was by design, to ensure that my first open water dives would not be too taxing; and so that I could concentrate on my skills. The next day’s dives were intended to show me a very different dive experience, and to educate me that not every day is entirely pleasant. Sunday morning I met Marty again, and we drove to Lancaster to dive in the quarry there. This quarry offered considerably more depth, averaging about 30’ with a deep trench that went down about 60’. I had been looking forward to swimming the trench, because I was eager to see what an extremely low visibility environment was like. My second dive at Circleville provided only a glimpse of what reduced visibility was like; whereas Marty described the tench as having almost no visibility. I admit that a part of me thought that perhaps he was being overly dramatic, in order to set my expectations. After a briefing, and some discussion of additional safety concerns in the trench, we entered the water and proceeded down the line toward a platform. The water was much cooler as we descended, and as visibility began to decrease I became increasingly concerned that perhaps I had bit off more than I could chew. The visibility was not at all what I expected. I had expected dark, almost blackness, but that wasn’t the case: it was greenish white. There was a lot of silt and sediment on the bottom that was easily stirred up, so we had to be very careful not to make things worse for ourselves by kicking too vigorously, or placing our hands on the bottom. We had planned for a 40 minute dive, of which maybe half would be spent crossing the trench at depth. As we descended into the cold murk, I found myself struggling to relax. I put my arm out, and could just barely see my fingers. I could see Marty’s hand in front of mine on the line we were following, but could not see his body. I began to appreciate how honest he had been on the surface when describing the conditions in the trench. I was, however, able to read all my gauges, and was pleased to see that we descended to a depth of 51’. As we rose from the trench, we followed a line back toward a sunken Frito Lay truck. Here my right flipper fell off my foot! I alerted Marty, and he positioned me on the side of the truck, and signaled for me to sit tight. He then descended into the dark, and I was completely alone. It was a little unnerving, but it was simultaneously very relaxing. I had nothing to worry about: all the stress and bother of the surface world was above me, past 40’ of cold water. All I had to worry about was breathing, and my tank still had plenty of air, especially since I was immobile and not using a lot of oxygen. After about two minutes, I felt Marty’s hand on my foot. He then jammed the flipper onto my foot, and rose to ask me if I was okay. I gave the “OK” signal, and we set off along the line back toward the destination for our safety stop. After we exited the water, we talked for a bit about the trench. It was, without a doubt, the most memorable experience of my diving certification. I can’t say that it was my favorite experience, but neither was it really a negative experience. I think I’d like to do it – or something like it – again some time. Marty informed me that in the trench I was kicking powerfully enough to push us both along, and while we had planned a 40 minute dive, we were only down for 26 minutes! I guess I was colder and more anxious than I realized! After our surface interval, we returned to the water for my final dive. This was a pretty easy dive. We followed a line toward a culvert that Marty had helped sink in the winter time. We swam through it, and then on to a sunken airplane. I felt a mild sense of horror as I observed a skeleton sitting in one of the cockpit chairs, but reassured myself that surely it was fake, and even if it wasn’t it must have been intentionally placed. Aside: one of my biggest fears regarding diving is the idea that I might discover a body. The prospect that a vague shape in the murky distance might resolve itself into a drowned human being was really unsettling for me, so seeing the skeleton made me feel somewhat uncomfortable. Similarly, I’m terrified of sharks, and afraid that one might come up to me from behind. In the south quarry at Circleville is a large plastic shark mounted to a frame. When Marty pointed it out to me, I had a momentary sense of panic, even though I knew it was fake! We circled the plane, then entered it from the open cargo door in the side. We swam through the body, and exited out the front, past the skeleton. It was an interesting experience to be inside something while underwater. I can see why wreck diving is such an interesting hobby for some people, and it’s something I think I’d like to try myself sometime. After the plane, I started feeling very cold, and signaled this to Marty. We altered our path to follow a contour of the quarry back through slightly warmer water. We reached our exit point, performed our safety stop, and then rose to the surface. All in all, the diver education and certification process was a lot of fun; and I’m really glad I did it. I’m looking forward to diving again. I doubt I’ll be a regular diver, but knowing that I have the activity available to me should I choose to do so makes me pretty excited about the prospect of vacation in interesting places!